The research presents Analysis of Yahoo! Inc. A complete and comprehensive analysis of Yahoo! Inc, includes an overview of the industry the company operates in, a PEST Framework Analysis of the industry, and then moves on to analyzing the company itself. Yahoo! Inc. (Yahoo!) is a digital media company. Through the Company’s technology and insights, Yahoo! delivers digital content and experiences, across devices and globally. The Company provides online properties and services (Yahoo! Properties) to users, as well as a range of marketing services designed to reach and connect with those users on Yahoo! and through a distribution network of third-party entities (Affiliates). These Affiliates integrate its advertising offerings into their Websites or other offerings (those Websites and other offerings, Affiliate sites). The Company generates revenue from the display of graphical advertisements (display advertising), the display of text-based links to advertisers’ Websites (search advertising), and other sources. Its offerings to users on Yahoo! Properties fall into three categories: Communications and Communities, Search and Marketplaces, and Media. Its offerings are available in more than 45 languages and in 60 countries, regions, and territories. It has properties tailored to users in specific international markets, including the Yahoo! Homepage and social networking Websites, including Meme and Wretch. Company analysis includes a history of Yahoo! 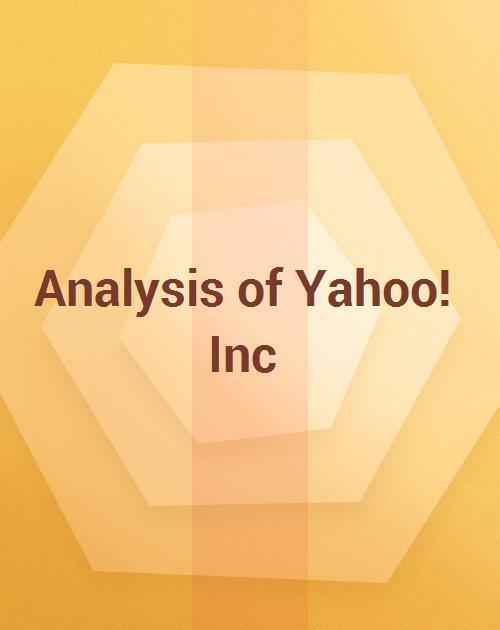 Inc, a business segment analysis of the segments Yahoo! Inc operates through, a look at the organization structure of the company, a geographical operating segments analysis, an analysis of the company’s major competitors. A financial analysis of Yahoo! Inc is presented in the report which includes a ratio analysis, basic profit and loss analysis, presentation of the company balance sheet, and much more. A SWOT Framework Analysis of Yahoo! Inc and its competitors completes this in-depth company analysis.